With good news so thin on the ground these days, it's great to find one positive piece of economic data. You'd think there'd be cheering in the aisles; there certainly ought to be. WITI Member Jody Colvard of WiredRightNow.com will lead an insightful, weekly interview with Marcia Wieder, Carolyn Leighton, Genevieve Bell, Robin Raskin, Margaret Heffernan, and many more presenters graciously sharing their time, stories, and insights. We will record and iPodCast the interviews so you can listen to them at your leisure. It's Free! Register now! Space is limited to 200 people for the Series. The fastest way to alienate your clients, employees and business partners is to communicate poorly. Many of us fall prey to "communications traps" that bruise business ties and stall sales. And we often don't realize the impact. The traps appeared before my eyes when I received a monthly email newsletter... I normally look forward to the pearls of wisdom from this well-heeled technology strategy firm. This time was different. After the first paragraph, I was ready to delete the message. WITI Talk TeleClasses: New Classes Start Next Week! Do you jump out of bed in the morning excited to go to work? What about your coworkers? Are you energized by their passion and enthusiasm? Chances are, if you are like most people, you don't use "passion and vitality" and "work" in the same sentence. The REAL YOU is locked up at home and you've forgotten where you left the key! Janice, as a WITI Member, submitted this article to WITI for publication. Do you have expertise to share? WITI gladly accepts submissions for publication! For more information or to make a submission, please visit the Members' Area. In January 2005, Melissa A. Stolow, Ph.D. founded Marketing Frontiers, Inc., a niche consulting firm that provides targeted solutions for the life science industry and fills the gap as an outsourcing partner specifically for life science product and service providers. The company transforms a client's goals into sales dollars using cost-effective marketing and business strategies. Being trained as a Ph.D. research scientist gives Dr. Stolow a critical edge over other marketing experts. In an effort to support the scientific research, every time she meets with a potential new client, Marketing Frontiers makes a donation to the Lance Armstrong Foundation (LAF), an organization that provides the practical information people living with cancer need to live strong. In addition, each client receives a LIVESTRONG™ yellow awareness bracelet from the LAF. It is Dr. Stolow's and Marketing Frontiers' way of helping spread the word about the need for continued support of cancer research and those affected by this disease. Sponsors and Exhibitors: Join us Apr. 6th for a sponsor information luncheon sponsored by Raytheon to learn about how your company can participate in the National Conference and other WITI programs. Contact [email protected] or (800)334-9484 for more information. 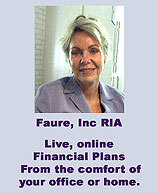 Penelope Faure and Faure, Inc. RIA, are pleased to announce online financial plans. We have a live, interactive web conferencing environment for meetings, that makes this experience an excellent alternative to in-office visits. We'll meet over the phone and online with you in a pleasant, interactive, live, presentation environment at times that are convenient for you, our client. When you can't meet in person or travel, but still need and want an excellent financial planning solution, and to interact with real people, please think of us. We provide all the amenities that you'd expect along with a customized fully developed financial plan. All sessions are recorded for your pursual at your leisure. A cd of the sessions as well as the financial plan are provided at the conclusion of the process and a collaborative copy of your financial plan is maintained online for you. Major credit cards are accepted. For more information, please visit www.themoneytalks.com or contact me directly at [email protected]. The successful candidate will report to the Director of IT Infrastructure Services (ITIS) and work closely with the general managers of Enterprise Architecture, Data and Systems Engineering and Head of Architecture, Planning and Integration ITIS. In the role of ITIS Head of Architecture, Planning and Integration, will be accountable for the development of a multi-year integrated infrastructure and technology plans to serve as blueprints for re-engineering, new technology/platform implementation, and legacy infrastructure and technology retirement, resulting savings in systems integration and infrastructure operation costs.